Realizing ROI for Software-Defined Networking (SDN) in the campus LAN or even the data center has proven elusive. But not so with SD-WANs. The ROI is dramatic and immediate. 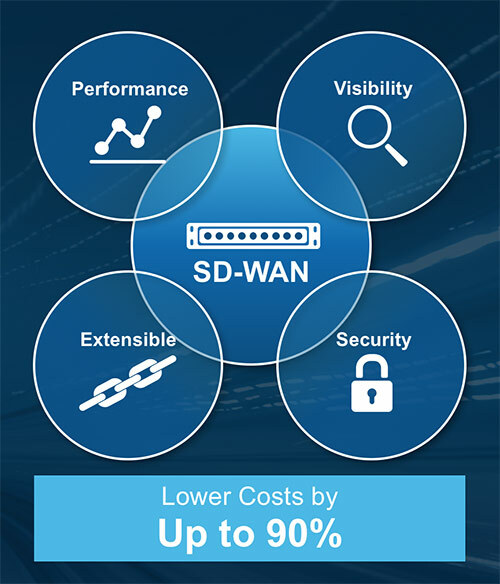 With an SD-WAN solution from Silver Peak, you can now augment or even replace MPLS connections with broadband internet services to connect users to applications and lower WAN costs by up to 90%. A simplified, centrally managed SD-WAN architecture also lowers OPEX. The Silver Peak Unity Orchestrator enables rapid branch deployments with zero-touch provisioning. Bringing a new branch or remote location online is easy and can be done in just a few minutes: connect a Unity EdgeConnect appliance, physical or virtual, to the LAN and WAN links serving the branch, plug it in and turn it on. No specialized IT expertise is required on premise at the branch. Zero-Touch Provisioning and Centralized Orchestration streamlines IT operations while increasing business agility. EdgeConnect automatically “calls home” to the Orchestrator where an existing configuration is downloaded to the branch appliance. When any configuration changes are needed, IT programs them centrally on the Orchestrator and with a single click, changes are automatically “pushed” to all of the EdgeConnect SD-WAN appliances across the WAN. While all existing WAN equipment is fully compatible with EdgeConnect SD-WAN appliances, Silver Peak can also consolidate branch office equipment requirements. EdgeConnect integrates routing, basic firewalling and WAN optimization functions for “broadband-only” installations, further lowering CAPEX. The speed of business continues to accelerate. Competition is fiercer than ever; customer expectations are higher than ever. 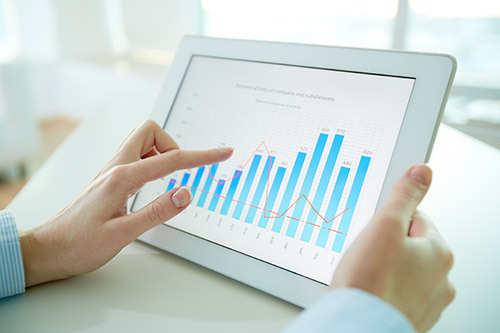 Today’s businesses run on applications and rely on connectivity, and when you’re opening up new sites or branches, time is money. Geographically distributed organizations often have hundreds or even thousands of branch offices connected to hub or headquarters’ sites. For security reasons, cloud-based application traffic is often backhauled from the branch across expensive WAN links to a hub site before being handed off to the Internet. Not only is this expensive, but performance is often compromised due to WAN bandwidth constraints at the branch and added latency from backhauling connections. A solution is to use direct Internet connectivity that provides simpler and consistent performance to cloud-based applications. With a Silver Peak SD-WAN, Internet connections become secure and reliable. Spinning up a traditional WAN service or enhancing an existing one can take weeks or even months from the time the order is placed with a service provider, although ubiquitous broadband internet services are available virtually on demand. By using broadband for WAN connectivity, a branch can be online in hours instead of weeks. Applications are the lifeblood of every business today. If applications are down, business stops. If applications run slowly, worker productivity drops often resulting in revenue lost forever. And now, many business-essential applications run in the cloud and are accessed by internet connections. Geographically distributed organizations often have hundreds or even thousands of branch offices connected to hub or headquarters’ sites. For security reasons, cloud-based application traffic is often backhauled from the branch across expensive WAN links to a hub site before being handed off to the internet. Not only is this expensive, but performance is often compromised due to WAN bandwidth constraints at the branch and added latency from backhauling connections. Using direct internet connectivity that provides predictable performance to cloud-based applications and simply makes good sense. Silver Peak Live View monitors network underlay and overlay performance in real time. Path Conditioning assures application performance, even when the underlying transport services experience brownout conditions. But the internet has a reputation for unreliable data transmission. To address this shortcoming, Silver Peak Unity EdgeConnect includes sophisticated path conditioning techniques that can reconstruct packets lost in transit, avoiding re-transmission. 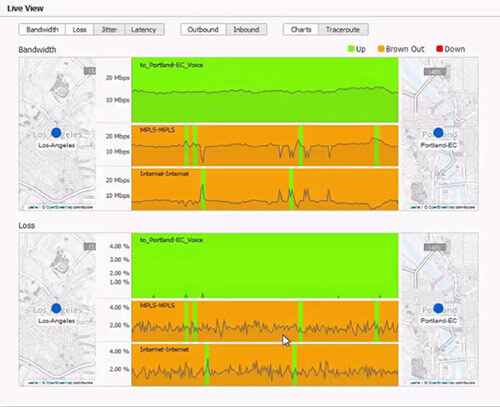 EdgeConnect overcomes performance issues of the underlying transport rather than simply routing traffic around the problem. This ultimately provides better resource utilization, higher application performance, improved productivity, a better user experience and lower bandwidth costs. Another SD-WAN value proposition is to use ALL of the available bandwidth, not just choose between path A and path B. However, path selection must also prioritize business-critical applications over less important apps. Silver Peak’s unique tunnel bonding creates application-specific virtual WAN overlays from multiple physical WAN links. Traffic is routed using all available bandwidth on multiple links. But should a link fail, the remaining paths keep the application up and your business running.